The Google Chromecast is simple and brilliant. It's one of those perfect little "duh! Why didn't someone do that before?" ideas. I didn't realize I needed one until I realized that I've been chasing the idea for years. In fact, I put together a poor man's "AirPlay Raspberry Pi" Chromecast last year. By plugging my Raspberry Pi running RaspBMC into my Receiver and using it just for Airplay, I was effectively using it as a Chromecast. You can agree or disagree in the comments, but here's their idea - most of us don't need set-top boxes. The world's big technology companies clearly want to control the largest screen in the house. So far, that's the TV (if you own one.) If TVs go away, it'll be the largest monitor in the house. What's the best way to control this screen? But each of these devices is a darn-near full computer with an OS, and storage, and a life and ecosystem of its own. What we really want is to use our TVs as wireless displays and use the power of our phones, tablets, and computers. Until one of the world's wireless display formats is finally declared the winner, they'll keep making set-top boxes portable computers to connect to our TVs. We could wait for $1000 receivers to include Wireless Display functionality, or build it into HDTVs. No! Let's make a $35 dongle that capitalizes on the fact that HDMI has finally won. It'll plug into any monitor and we suddenly that HDMI connection is available over wireless. It's open, in fact, to anyone who is on the network. You just plug the Chromecast into any free HDMI port and get power via micro-USB. Many TVs have a USB port that can provide this power. I used the always-on USB port from my TiVo as it was open. When you plug the Chromecast into your TV you'll connect to its initial ad-hoc wireless network and teach it about your wireless network. Then it'll reboot and jump sideways onto your network and most of your config work is done. The only way to change the Chromecast at this point is to hard reset it. The wireless setup process is very similar to other embedded wireless devices like the Nest Thermostat, FitBit Aria Scale, or Twine Wi-Fi device - connect to ad-hoc, setup locally, jump. It took all of 2 minutes. 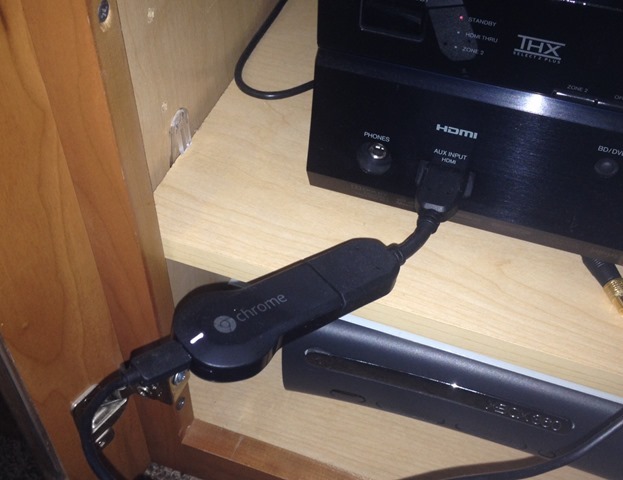 Here's my Chromecast plugged into my Onkyo TX-SR674 Receiver's front HDMI port. Make sure your phone's YouTube and Netflix apps are updated. They all got Chromecast support automatically last month. From inside the Google Chrome browser you add the Google Cast extension that lets you play content from within Chrome to the Chromecast. You can cast a browser tab to the screen and show a friend what you're browsing, which is actually very cool and useful...when it works. More on that in a second. When it works, it's fabulous. For example, at a recent party someone mentioned a funny YouTube video. Within 30 seconds I had it up on my iPhone, then threw it to the Chromecast. That's exactly how it should work, right? 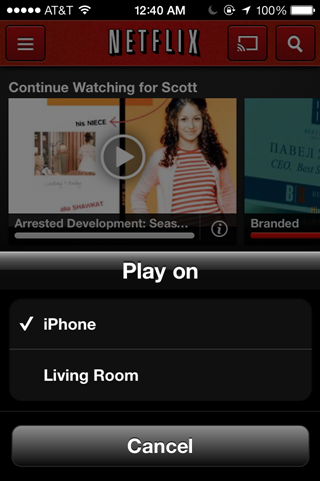 I've thrown video to the Chromecast from all my iDevices in both the Netflix and YouTube apps. There is a hand-off and then, interestingly, the Chromecast takes over the stream. Rather than the phone or tablet pulling the content down then pushing it again laterally to the Chromecast, there's a little YouTube applet or NetFlix applet running on the Chromecast. The Chromecast inherits or hijacks the stream. All of this is transparent to the user, of course, but it's a clever implementation which allows you to close the app and do other things with your phone. Each app looks a little different. 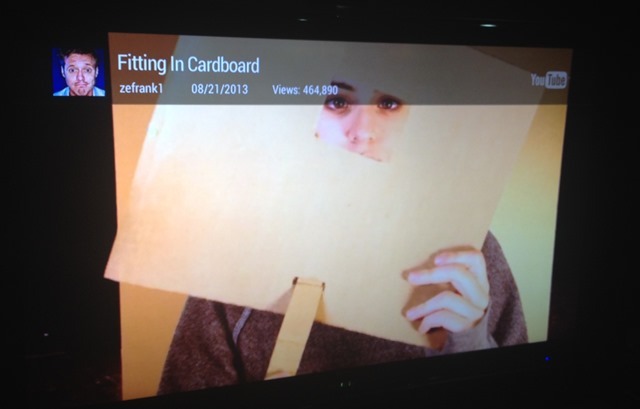 The YouTube iPhone app shows Views, avatars, and the date when pushed to the Chromecast. Being able to use your Tablet as a remote is great. Myself, I get this functionality in three totally different ways across my devices, but the result is the same - tablets are good remotes. I have the Tivo App on my iPad, I have the Xbox Smartglass app on my iPad and Surface, and I have the YouTube and Netflix apps on my iPad talking to the Chromecast. HDMI-CEC is the ability for the Chromecast to automatically tell my receiver to switch to the right HDMI input when content starts playing. It would be amazing if my receiver supported it. If your system has HDMI-CEC the Chromecast will set your inputs for you and remove a step which has a high WAF (Wife Acceptance Factor or Non-Gender-Specific Spouse Acceptance Factor). My computers just can't see the Chromecast anymore. They could last week. This is extremely odd considering we are all on the same wireless network and that the phones and tablets work reliably. You'll find the forums filled with people fighting with this issue. They're having to disable firewalls on MacBooks and turn off IGMP Proxies on FIOs Routers. I've done all that and while on the first day my first laptop was able to cast its Chrome Tabs to the TV, a few days later either Chrome or the Chromecast auto-updated itself and now it's just dead. No matter, for $35 it's a great device. It works as advertised on both iPhone, iPad and Android, although the settings for casting from iPhones are a little inconsistent and hard to find in Netflix and YouTube. The Chromecast troubleshooting should be more polished (today it's just a link to a FAQ, with no diagnostics) but since Chrome and the Chromecast both appear to be updating quite often, we should see improvements soon. If I had paid $80 or more, I would be more frustrated with my inability to use the device from my desktop and laptops, but the tablets and phones have been rock solid. I'd love to see the Chromecast become a more generic wireless receiver and be extended to support Apple's Airplay, as well as Miracast which is now built into Windows 8.1, and WiDi that Intel supports (although Wi-Di also supports Miracast as of WiDi 3.5). Unfortunately though, here we are again with FOUR companies each betting on a format to win while the consumer is left to pick a horse. Which wireless display format will become Bluray and which will become HD-DVD? It's anyone's guess. I'd like to see an open format win. However, for now, and for only $35, I'm happy with the Chromecast. Sponsor: A big thanks and a warm welcome to Aspose for sponsoring the feed this week! Check out their Aspose.Total for .NET has all the APIs you need to create, manipulate and convert Microsoft Office documents and a host of other file formats in your applications. Curious? Start a free trial today. I like my Chromecast too. I was able to get the 3-month Netflix promotion when I purchased it. Since I am already a Netflix subscriber, the Chromecast only cost me $8 plus shipping if you subtract three months of Netflix fees which I am already paying. A cutting-edge tech toy for (practically) free? Yes please! When you tell it to start streaming, it automatically switches your input on the TV for you. This is awesome. The AppleTV and Roku don't do this. It is a subtle feature but it makes the experience so much nicer. 1. It doesn't work (yet) with Windows Phone. This is frustrating to me, although it can be argued that this is a flaw in the WP ecosystem because it isn't (by far) the first innovation that I haven't been able to partake in because I am a WP user. The Chromecast, however, will be my biggest motivator to switch back to the iPhone if I can't use it on my WP soon. 2. I miss my IR remote. In theory, I thought that a phone/tablet remote was a great idea. In practice, I disagree with myself. With an IR remote, the latency between wanting to pause and actually pausing is extremely short (as long as you know where your remote is). With a tablet/phone, the context switch to turn the phone on, enter my lock screen password, navigating to my Netflix app (which sometimes needs to re-start because it has been unloaded from memory) and pausing the show can take as long as 30 seconds. All while my significant other is tapping her foot, waiting for the chance to talk to me about something. I find the phone/tablet as a remote to be a nice backup, but I still want an aTV-style remote for my Chromecast. On your second bad point, it might be that they can add the ability to pause using your TV remote at some point through the HDMI connection. My TV remote can do some basic control of my blu-ray player and I'm pretty sure that it is doing it through HDMI. One fine day, Everything Will Just Work and we techies of the home front can lean back and have a nice cup of tea. Another Downside, you cant run videos stored in your network drive, which is why I prefer smart TV over chromcast . may be they are keeping it for the next version or google want you to always be online . Great review, Scott. The Chromecast is great for what it does and for the extremely low price point. I agree with Sam's downside: not being able to directly stream videos on your network drive is definitely a negative. Hopefully, this will be solved by something like making Chromecast compatible with Plex. I'm eagerly waiting for Plex support as well. Does it have DLNA Play-To functionality, or is DLNA being superseded by all these new protocols? Sorry to be off-topic, but very glad to hear you guys will be getting a new CEO. Hopefully one with some vision and who will abolish the ridiculous stack-ranking that is supposed to go on at MS.
@Sam, I believe you can if you view the video from within the Google Chrome web browser. Check out this video from Android Authority. The discovery part is SSDP/uPnP so if it's not showing at all I'd try rebooting home rooter then maybe messing round with some SSDP tools. I don't know much about this device, but I think it would be nice to use something like this for a 2nd, 3rd, 4th, nth wireless monitor. Of course your bluetooth proximity sensor could switch to the displays nearest you so you can use your computer from where ever you happen to be. It seems as this is purely for streaming consumer content though. if so that is too bad. Maybe one day my vision will be come a reality. I do really like the form factor and that it just connects to HDMI though. I was able to get the Chromecast working with my laptop by disabling Hyper-V. It seems something in the network bridging adapters breaks it. For the price, it is great. But I have not found a use for it outside of testing so far. - You can broadcast any video that Chrome/VLC can decode by just dragging the video file onto a Chrome tab and casting that tab. It's a little laggy, and the voice sync may not be perfect, but it works. It uses VLC as the transcoding engine for video formats Chromecast can't decode directly. At $35, this thing is so accessible that the pace of innovation should keep moving forward. 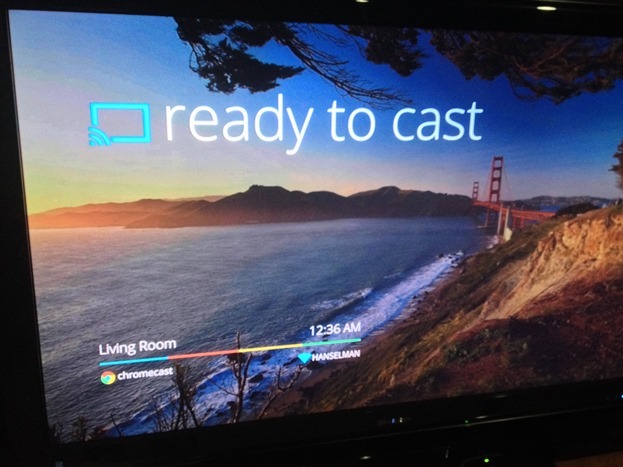 BTW, based on industry happenings, Miracast and WiDi are all but dead. No Android phones are even mentioning support for them, and you won't find them on an iPhone any time in this millennium. Yeah, the hyperv virual adapter and switch cause all kinds of fun problems. Its needed for the wp8 emulator if you want network access, but when not using that i disable them. My favorite feature of the Chromecast by far is the integration with Chrome. Being able to quickly throw up the current tab to the big screen is killer. It auto scales for me and is the most seamless iteration of this type of technology I've used to date. I've had the "what did I ever do without this" moment several times in my home office when showing others a web app...great for demos running locally. Previously i would use a screen share (rdp, join.me, etc) or hook up another computer to the big screen...but who want to go through all of that when i can just ctrl-f5 and send the tab up with one click of the chrome extension. Wireless streaming to tv is definitely the future. I find myself using this all the time with my iphone and apple tv. The great thing about it is that the streaming from ios is built into the os, so it doesnt matter what app is playing. If theres sound coming out of the iphone speakers or theres a video showing on screen, i can stream this to my tv. In worst case i can clone my iphone screen (fun with facetime :) ). The only downside is that its apple only. We need a wireless format built into every os that can essentially replace hdmi. I am disappointed to find out if you need a USB cable to power it. I suppose that's not a big deal but when you look at the picture of it, it doesn't seem obvious that you need to put a USB in the back of it. I'm not sure how I thought it would get power but I didn't think it was that way. No biggie. I ordered mine on Amazon, but because it's backordered I think I have to wait till October. It's not the first time Google puts out an amazing product and then runs out of stock. I wish they would figure that out, I feel like they can do a little better. I know I sound like I'm complaining, but I'm really not trying to. I love all the stuff that Google print out. @Sam ~ you should be able to play any video on your network drive by dragging the vid file onto chrome, then casting that. It's a bit of a work around, and you can't do the same on mobile (yet) but hey it works. Google music subscription plus the Chromecast is the killer app, especially if you have Android tablets around the house. I'm setting one up for my non-techie mom next week. I am not so technologically connected as Scott but this just seems to be another example which encourages the luddites like me. I thought the PS3 was supposed to be the universal, plays music, plays videos, connects to the internet, play games, etc "you won't need anything else" device. I thought the Xbox was supposed to be the universal does everything "you won't need anything else" device. Etc, etc, etc. 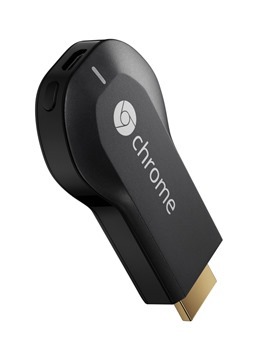 Now we have Chromecast which is another universal "you won't need anything else" device. Except ... it only works sometimes or with some things and you do need other devices. Dammit when am I going to be able to play 'Hamster on a piano' whenever I want, on any screen from any device. This is intolerable. Does Scott now have 5 "universal, you don't need any other device" devices connected to his TV? As for, 'setup is so simple it will always work you do not need any ability to see what is happening or change settings' devices. The arrogance is overwhelming. Bah humbug, a pox on all your houses. Bah, with the amount of trouble I've had with my Samsung so-called *Smart*TV, I wish I hadn't spent the extra money on it. Regular, SLOW, forced firmware upgrades, really slow UI for typing anything with the remote and a wireless dongal that doesn't work when all my other devices work at that distance. Never again will I trust Samsung in my livingroom! I certainly agree that I don't want the TV manufacturers to control that aspect of our lives. I have a Panasonic smart tv and see very little reason to pay an extra $35 dollars for duplicate features. I used to think my XBox was something I needed but with Smart TVs I think my dependence on XBox will fade as well. Given Google tries to gather/mine/sell as much information about me as possible I don't want them in my living room. It (mostly) reads good what you write about the Chromecast device. I just looked up how I could buy it in Germany, but I must say it feels more like being ripped off. Amazon.com sells the device for $35 and Amazon.de sells it for 99€. That is 3.7 times the price at current exchange rates. If I buy a Chromecast for each TV in my house, will I be able to watch different things on each TV at the same time (Netflix on family room TV and YouTube on a bedroom TV)? Does anyone know when Google will allow third party apps for Chromecast? I read that a recent update denied the use of apps like Fling that allow you to stream local files. Have they released that information yet? 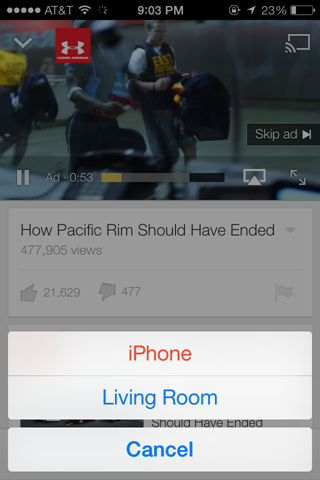 Yes, you should be able to cast to multiple places from multiple devices from what I can see. Smart HDMI sticks has been around for more than two years and they are much more functional as they support Miracast, DLNA connections and allow you to share offline local content. Seems to be working O.K. for me and I even got it working on XP at my house. I do agree it's a little fussy and there are some other things I'd like to see. Like if I go tubeplus.me and watch a movie in full screen mode I can cast it to my TV, but I can't surf the web. I can cast the tab and watch the movie in a smaller screen while surfing, but just not in full screen. Bummer. It's worth $35 bucks. Hey guys, thanks for the feedback. Chromecast has been great for my needs. Don't have Cable TV and have been using the Chromecast, Chrome browser and AdVideoTISE.com Video Channels for all my music videos, movies, tech news, sports, world news etc. it works perfect with my windows PC, my iPad works great with Netflix and Youtube. 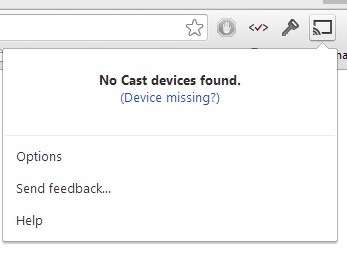 Will like to have the update allow casting from Chrome with iPad, and smartphones. Really don't see how cable tv can survive unless they change with this technology. Thanks Scott. Just got a Chromecast given to me. Epic fail! Two degrees in Electrical Engineering and 15 years experience in software and, like the author, I could not get it to work. Beyond that, the lack of DLNA support means this device is completely crippled. Every other software platform in my house, from the PlayStation to our Blackberry Z10s has DLNA built in for seamless streaming-- it just works. Not only does the Chromecast not do anything it advertises (because it just fails to launch after the software update), it doesn't even support this basic and ubiquitous protocol. Google used to build great products! I still use gmail, and their search engine. But these recent forays show that they can't deliver any meaningful innovation to the same standard as their old guard of simple, reliable, useful products.